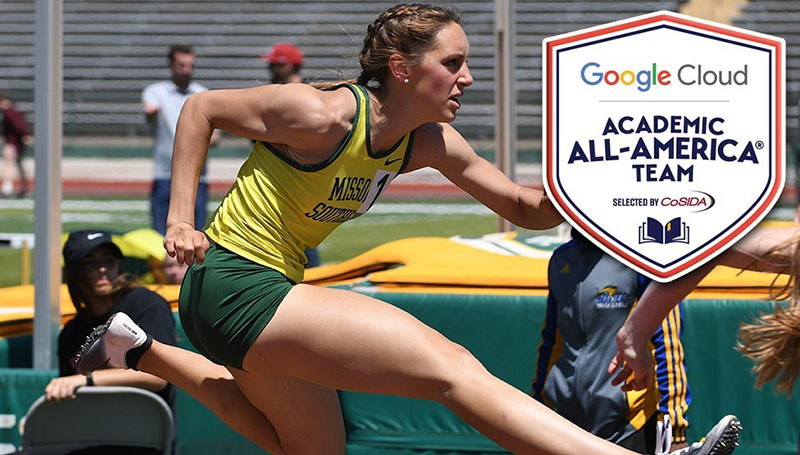 Missouri Southern senior track and field student-athlete Allie Heckemeyerhas been named a Google Cloud/CoSIDA first-team Academic All-American, the organization announced today. To be selected for the award, student-athletes must be at least a sophomore in academic standing, as well as not being a first-year transfer to the institution. Student-athletes must also maintain a minimum of a 3.30 GPA, as well as participate in at least 50 percent of their team’s competitions. The award is voted on by sports information professionals throughout Division II. Heckemeryer was a first-team All-District selection earlier in the month. This year, Heckemeyer was named the MIAA’s Ken B. Jones winner, an award that goes to the top male and female student-athletes in the league, encompassing not just athletics, but academics and community service, as well. She also won the MSSU E.O. and Virginia Humphrey award which goes to the top student-athlete at MSSU and was a winner of the MSSU Glen Dollence Award for leadership given to graduating seniors at MSSU. She graduated in May with a 4.00 GPA in kinesiology. She is also a two-time NCAA Elite 90 Award winner, which goes to the top GPA in the gender at the NCAA Championships site. Heckemeyer is the school record holder in the indoor and outdoor triple jump, as well as the indoor pentathlon and outdoor heptathlon and was All-MIAA this year in four different events. She was the MIAA Champion in the indoor pentathlon and outdoor heptathlon. Heckemeyer earned All-American honors this year in the indoor pentathlon, outdoor heptathlon and both the indoor and outdoor triple jumps. She was a team captain, a member of Catholics on Campus, Delta Kappa and Alpha Chi honor society and K-Club. Heckemeyer is one of three MIAA student-athletes to be named Academic All-American, all three earning first-team honors.